May 15th, 2017 marks the 69th anniversary of what is recognized by Palestinians as “al-Nakba Day,” or “Day of Catastrophe.” The Palestinian people reflect back upon this dark day in 1948 with endless sorrow and grief as they recall the events that occurred, in which thousands of their inhabitants were exiled from their homes and dispersed across neighboring countries such as Jordan, Syria and Lebanon; forced to dwell in squalid refugee camps. Whosoever chose to resist this clear violation of dignity and human rights was either martyred or arrested. In the Western world, this issue is typically regarded as a ‘left-wing vs. right-wing’ partisan issue, whereas the Palestinians themselves have no concept of such political frivolity. To the Palestinians, this issue is solely about the destruction of their entire culture, civilization and identity; one’s alignment on the political spectrum is irrelevant in this respect. What happened on that fateful day, the events leading up to it and those which occurred afterwards have extreme significance in Palestinian heritage and history, which is still being written. Palestinians trace their heritage and historical lineage in the Holy Land from the time of ancient Canaan. The ancestors of modern-day Palestinians were close relatives of the ancient Hebrews, whose roots in the Holy Land date back to 1400 B.C. From 732 A.D. to 1258 A.D. Palestine was under control of the Arab-Islamic Empire, which was one of the most advanced empires of its time; renowned for its intellectual achievements in medicine, philosophy, astronomy, mathematics, optics, physics, chemistry, architecture and the arts. After the rise and fall of the Arab-Islamic Empire, when the Mongols invaded and proceeded to destroy much of Arab civilization in 1255, the region was subject to the brutal rule of the Khan Dynasty for 260 years. In 1517, the Turkish-Ottoman Empire seized control over the Holy Land. During World War I, as the British Empire was pursuing its own geopolitical interests in the Middle East, they formed an agreement with Arab nationalists in Palestine known as the Husayn-McMahon Correspondence. Within this agreement, the Arabs pledged to assist the British war effort by revolting against the Ottoman Turks, and in exchange the British promised to facilitate Arab nationalist goals of independence and unity after the war. In 1917, Great Britain administered the British Mandate for Palestine, granting the Palestinians ‘statehood’ within the confines of British military occupation. However, that same year Great Britain also issued the Balfour Declaration, pledging support for Zionist objectives in the Holy Land. The Balfour Declaration was a letter written by Lord Arthur Balfour on November 2nd, 1917. Lord Balfour was the foreign secretary of Great Britain at the time. The letter was addressed to Baron Lional Walter Rothschild, a British banker and Zionist peer. The contents of the letter expressed the British government’s support for the proposed Zionist state. By the 1870s, European immigrants had already begun sporadically constructing exclusively Jewish colonies in Palestine. The very first settlements were financed by French banker-baron Edmund de Rothschild. Rothschild proceeded to purchase several plots of land from absentee land-lords for agricultural colonies. In 1893, Palestinian leader Tahir al-Hussayni began to express concerns regarding the impending threat of Zionist colonial ambitions in the Holy Land. Zionist colonization efforts became systemic and internationally organized by the turn of the century. The first Zionist Congress was held in Switzerland in 1897, in the city of Basel. The stated objective of this conference was to “create for the Jewish people a home in Palestine,” by means of prodigious immigration, settlement-construction, and institution-building. The role of the Jewish National Fund was to globally raise money for the enterprise while the ‘Palestine Land Development Company’ would purchase land, organize settlements, and foster European immigration. These institutions eventually gave birth to the ‘Yishuv,’ the pre-state organizational infrastructure of the Jewish community in Palestine. In turn, this gave rise to the 1948 establishment of the State of Israel, followed by the Palestinian Exodus, or ‘al-Nakba,’ (catastrophe). In 1947 after the end of the British Mandate, Britain decided to leave the fate of Palestine up to the United Nations. A committee appointed by the U.N. was to forward a recommendation to the United Nations General Assembly upon investigation of the conflict. The committee was nearly split, with a slight majority favoring partition of the land. On November 29th, 1947, contrary to the wishes of the indigenous Palestinian population and under strong pressure from the United States, the U.N. passed resolution 181, calling for the partitioning of Palestine into a Jewish state and a Palestinian state. 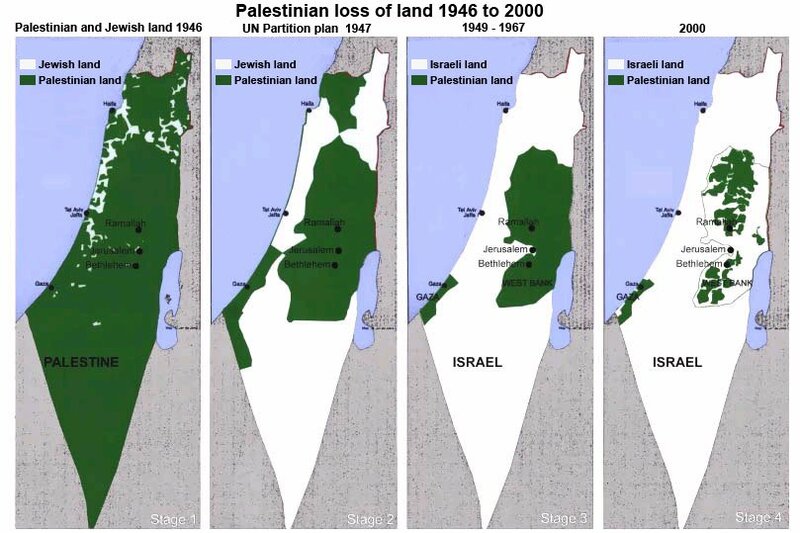 The Zionists were to claim 55% of the territory, while the Palestinians were to be left with 45% of the land. This decision was made despite the fact that the Jewish people had only managed to claim 31% of the population since the beginning of the Zionist project, whereas Palestinians still made up 69% of the population. The Zionists accepted this plan with serious reservations, as it still fell short of their territorial ambitions. However the Palestinians strongly rejected this plan, as it clearly implied the uprooting of thousands of innocent people. The rejection of this plan immediately resulted in the eruption of an inter-communal war between the Jewish and Arab population, known as the ‘1948 Arab-Israeli War.’ The Zionists were efficiently trained, well-funded and highly organized, whereas the Palestinians were exhausted, leaderless and disorganized from three decades of resistance to imperialism from all over the world. The Zionist forces had access to heavy artillery and advanced technology, while the Palestinian population had only light arms at their disposal. Outnumbered and disadvantaged, the Palestinians were no match for this Western-backed war machine, and the Zionists took the land by force. On May 14th, 1948 Israel declared its independence. As a result, the very next day on May 15th, over 750,000 Palestinians were expelled from their homes, countless massacres were committed, and 531 Palestinian towns were destroyed during the first wave of Israeli settlements. By December of 1948, Israel had already conquered one-fourth more territory than it was allotted in the United Nations partition plan. To this day, Israeli settlements continue to steadily expand into the territories which were meant to be reserved for a viable Palestinian state, as no such state has been allowed to be established or recognized thus far. Palestinians continue to be forced out of their homes to make room for the expansion of Israeli settlements which are illegal under international law. Today, there are an estimated 6.5 million Palestinian refugees worldwide. The Palestinian people are given no other option but to live under a system of brutal military occupation and apartheid administered by Israeli Occupational Forces. Palestinians are subject to constant checkpoints, roadblocks, searches, seizures, harassment, abuse, imprisonment, curfews, collective punishment and all other manner of human rights violations commonplace in ruthless military occupation. Statistics show that over 300 Palestinian children have been arrested and held in military prison by Israeli forces since the beginning of 2017 alone. Currently there are an estimated 6,500 Palestinian prisoners being held in Israeli military prison. Of these 6,500 there are 1,500 political prisoners that have declared a hunger strike which began on April 17th and is now reaching its 30th day. To put this into perspective, when Ghandi was made a political prisoner and went on his world-famous hunger strike, it lasted 21 days. All major resources in the region are under control of the Israeli Government, and this has crippled the Palestinian economy, as basic needs such as food, water and electricity are heavily restricted for many Palestinians in the occupied territories. This is particularly true in the besieged Gaza Strip, where 80% of Gaza’s groundwater flows into Israeli settlements and 1.6 million Gazans are dependent on neighborhood desalination facilities and their public taps for water. For every 300 liters of water that flows into settlements, only 73 liters flow into the occupied West Bank. 80% of Gaza’s population struggles with food insecurity and is dependent on international aid to survive. On top of all of this, Palestinians are subject to constant electricity shortages and power outages on a daily basis as the state of Israel allocates the majority of the power and electricity to Israeli settlements. In times of war, the comparative disparity in death tolls between the Palestinians and Israelis is staggering. During Israel’s last major offensive in the Gaza strip in 2014, known as Operation “Protective Edge,” over 2,100 Palestinian civilians were killed – at least 500 of those civilians were children, and nearly 300 were women. The Palestinian Ministry of Health states that 11,100 Palestinians were wounded, including 3,374 children, 2,088 women, and 410 elderly. Additionally, over 500,000 Palestinians were made refugees and displaced from their homes because of the conflict. Studies show that over 160,000 children are estimated to need continuous psychological support following the 2014 hostilities. When one compares these statistics with the death toll of 64 soldiers and 6 civilians on the Israeli side, the reality of the situation certainly becomes apparent. Upon realizing the ongoing plight of the Palestinian people, hope for their future looks bleak. Indeed, it is likely very difficult for Palestinians to see a light at the end of this tunnel. With the unwavering support for Israel coming from the West, particularly in the United States, it is clear the Zionist state has no intentions of halting and/or reversing their expansionist project, ending their brutal occupation or pursuing a legitimate peace process with the Palestinians. With this in mind, it is now more important than ever to seek an international consensus regarding this issue. In recent years, global solidarity with the Palestinians has gradually begun to increase as thousands of people from around the world are giving rise to an international movement in support of Palestine through advocacy, education, boycotts and protest. This includes efforts such as the International Solidarity Movement, which is helping Palestinians and activists pursue methods of non-violent resistance to the illegal occupation and shedding light on the facts surrounding the conflict. Another useful tool for advancing the cause of Palestinian rights is the BDS Movement, which is tasked with the objective of working to end international support for Israel through boycott, divestment and sanctions. This was the very same method that was used to end the abhorrent practice of apartheid that became commonplace in South Africa from 1948 to 1994. According to recent studies, support for the Palestinian cause virtually tripled among youth in the United States in 2016 alone. All of these facts, in a sense, give hope to the idea that what is currently taking place is a major shift in public opinion regarding the Israeli-Palestinian conflict. This could potentially have serious implications for the future of the Zionist project which is still in pursuit. If enough international pressure is put on Israel to end their expansionist efforts and inhumane military practices, it could change the entire course of history and secure a peaceful future for the Palestinians. Great insight. I hope people will read this and be enlightened by the truth. Thank you for this accessible, clearly-written summary of the historical & present-day realities of the Palestinian struggle. May we be informed and engaged. Peace.